When patio doors are pushed open too hard, or left open in windy conditions, they can slam into outdoor walls. This results in costly damage to both the wall and patio door itself. The Patio Doorstop is a brand new doorstop specifically designed to stop this occurring. Where a smaller footprint doorstop is required, we also offer our multistop, the ideal solution to side gates, school doors and applications where a robust, strong, small but perfectly formed door or gatestop is required. Don't forget our original doorstop is always available for more demanding scenarios. If in doubt, please feel free to call us on 07775 486683 to discuss. Or if unsure of the correct angle variant to order then you're welcome to send us a photo showing the door open position & we'll be pleased to advise. We recommend fitting the heavier duty 150mm doorstop to prevent bending through high wind loadings. 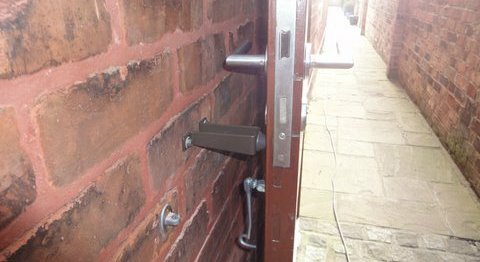 To match the cantilever of your door at the correct angle, for longer brackets, the adjacent magnet can be positioned further along the bottom of the horizontal door. This should provide for a stronger hold on the door in moderate wind. Our magnetic options are great but please bear in mind that these are not electromagnets, they are the strongest neodymium magnets available. They're incredibly strong but please bear in mind the size, weight & windage of your door. Doorstops top & bottom are advised for anything other than a small, light door. If in doubt, ask us for advice! We now have a 150mm version of our Standard (Angled) Doorstop available - ideal for protecting wall-mounted lanterns against swinging doors! We now have our specially developed RoomStop, uniquely designed to fit on the architrave of internal room opening doors so now there's no need to worry about your internal doors either! Direct Bank Payments are also welcome. Simply use the checkout to check what the total is including shipping then make a direct payment & email us your order. If unsure of the best doorstop to use for your doors then please do contact us for advice - a photo really helps too! The doorstop works equally well to protect gates, garage doors, conservatory doors, stable doors & bi-folding doors from damage. Available in a range of colours and with high quality manufacture & Plascoat PPA571 coating standards, the Patio Doorstop will give years of outstanding protection no matter how harsh the elements. Photos of the original doorstop can be seen on the Photo Gallery page, photographs of the roomstop, multistop & ministop can be seen on their respective pages. 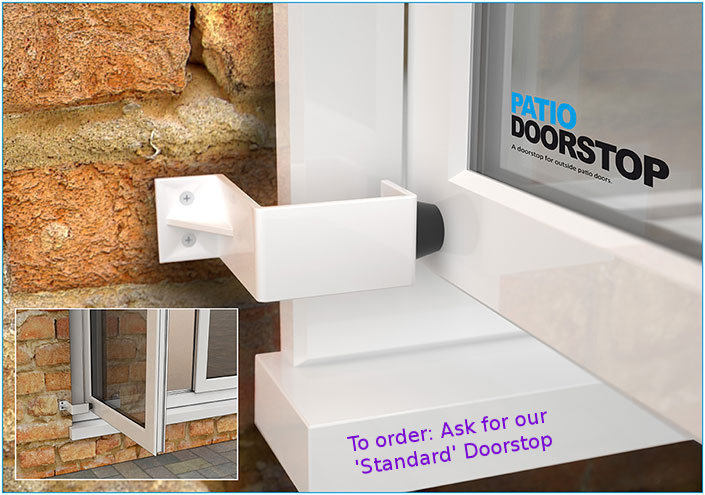 A Patio Doorstop Customer says: "Great product, exactly what I wanted. Had spent some time searching online and couldn't find anything else like it in design, or in the right colour to match my French window style patio doors. Very helpful supplier, they made me a pair of doorstops angled to fit my doors when fully open, and they do the job perfectly. Polite and courteous, and quick delivery." For those times when space is at a premium, we've also developed our MiniStop with its small footprint to fit in the tightest spaces, yet manufactured to the same demanding standards as the rest of the range. For Patio Doors. For Gates. For Bi-fold Doors. For Stable Doors. If a door can slam, then Doorstopworld it!